Some weeks ago I had the chance to meet Eric Delicati who is distributor of the Italian brand Terra Cielo Mare. This brand is not really visible today because of a lack of communication but honestly it’s a brand on which you should have a look. For the record, Terra Cielo Mare is a family business that produces watches for enthusiast and collectors since 1999. The interesting thing is that behind everyone of their watches there’s a real story to tell. That means that they try to develop and narrate the history of aviation, naval, mechanical engineering and Italy through Haute Horlogerie. That’s not the most common thing in todays watch industry. Indeed, most of the time, a designer draws a watch and then the marketing director says : “Ok, that’s a pilot watch. Let’s find something that will fit with that to write our press release and develop a strategy around“. No way… Here with TCM there’s real history behind all their watches. I saw the whole the collection and as always, the watches are far better in real than on pictures. I decided today to present you one of the pieces that really catched my eyes. This one is the Milano San Babila that they launched in 2017. Terra Cielo Mare (TCM) decided to create the Milano Series to commemorate “Milano” the throbbing heartbeat of the Lombardia region of Northern Italy. The Milano Series draws a portion of its inspiration for it’s design from the elegant and often sober Milanese citizens. The dial of the Milano Series incorporates historical and often-iconic structures found through out the city of Milan, such as: the Duomo Catherial (Milan’s Iconic Church), the Stazione Centrale (Central Station) and of course the Piazza San Babila. Milano stands out in history as a thriving industrial center and is known for its creative drive, becoming the capital of design, style and elegance. The Milan San Babila is a watch that tells the story of the city and its citizens sober and elegant style, and of course the dial is inspired by iconic and historical Piazza San Babila. Piazza San Babila is a place located in the historic center of Milan. San Babila has long been the meeting point favored by the Milanese upper middle class. 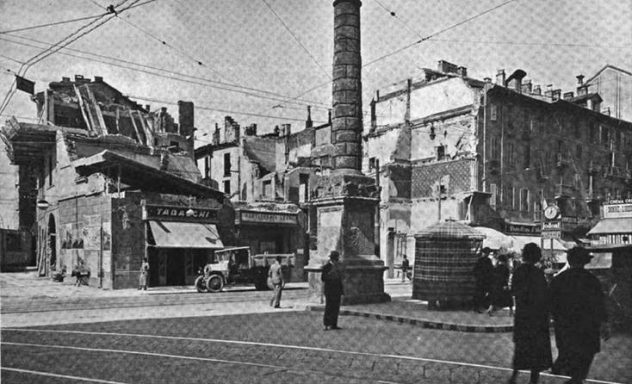 A large part of the architectures that delineate it date back to the 1930s, during the Fascist era. It takes its name from the basilica of San Babila. 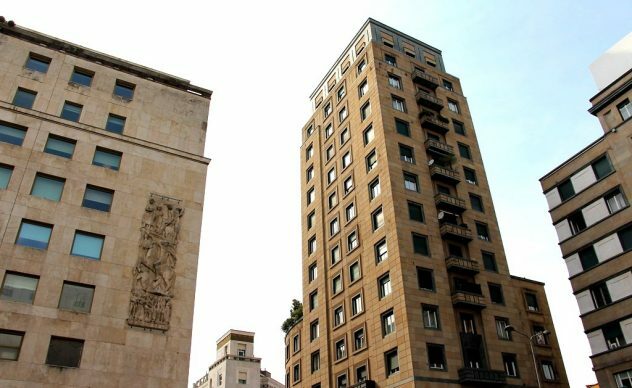 The place presents the “Torre Snia Viscosa“, which represents the first skyscraper built in Milan (designed by Alessandro Rimini, 1937). Piazza San Babila, is the symbolic and contradictory heart of Milan where, over the course of almost 40 years, shopping, political activism, aperitifs with olives, strategy of tension, youth subcultures and also the birth of a political party took place. Piazza San Babila is a square with a glamorous and fashionable vocation, and we will keep that in mind instead of is political history. The Piazza San Babila is known to be the epicenter for Milan’s so called “cultural revolution”. Today it’s still the most important place of the city of Milan. The TCM Milano San Babila design is a tribute to the “Milano da bere” (Milano to drink) and pays homage to this decadent, glamorous, hedonistic period in the 1980’s, when Milanese people were known for reckless behavior in the many café’s, bars and restaurants that surrounded the Piazza San Babila. 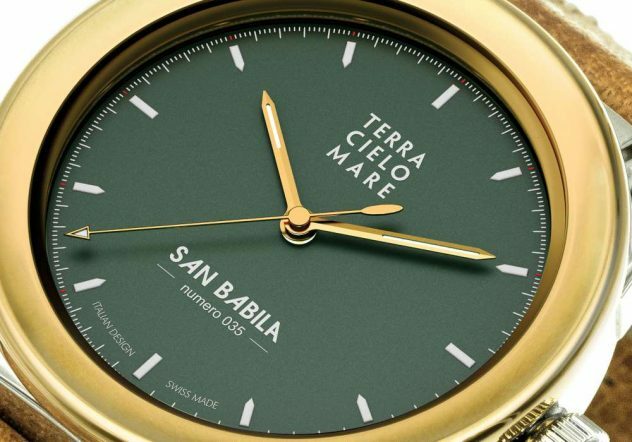 The green coloring of the dial on the Milano San Babila represents growth and hope for rewarding future. Note that , green is also representative of a casino table; people of this period were willing to gamble on their futures, with little or no regard for the prospect of a secure future: “everything on the table”, “it’s all or nothing”. This hazardous attitude of the classic urban Milanese encouraged personal growth, entrepreneurial talents, bringing wealth and prosperity to many. On the title of this article I said “The Lovely“, because yes it is. The Milano San Babil ais a trully unisex timepiece thanks to its size of 38 mm. That means it goes both for women and men. The design is something that reminds me some vintage pieces and the contrast between the polished stainless steel case and the phosphor marine bronze bezel is really nice and it matches perfectly with the brown hand-stitched English-leather strap. To be honest with you, I would prefer a brushed treatement on the case. Brushing gives metal a distinctive look, as it retains some but not all of its metallic lustre and is given a pattern of very fine lines parallel to the brushing direction. 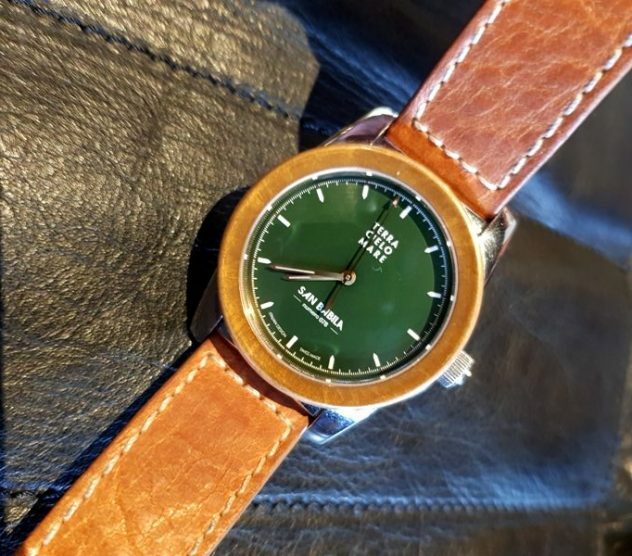 With a brushed finish, you can clearly see lines on the watchcase and this will give more character to the piece, and more than that, we would reach much more the vintage side of it. Here with the choice of a polished case we have something really reflective with the light and every other reflections (like yourself) in the watchcase. Not bad if you want to shine a thousand fire, but my personal choice would be a brushed finish. At the heart of the piece there’s the famous workhorse ETA 2824-2 that we all know, so no need to go further on the specs. The overall design and technical aspects of this piece are really good. The Milano San Babila can easily become your everyday watch if you want something with style, with a small size, and which has this little something that we can’t explain but that makes us love it. 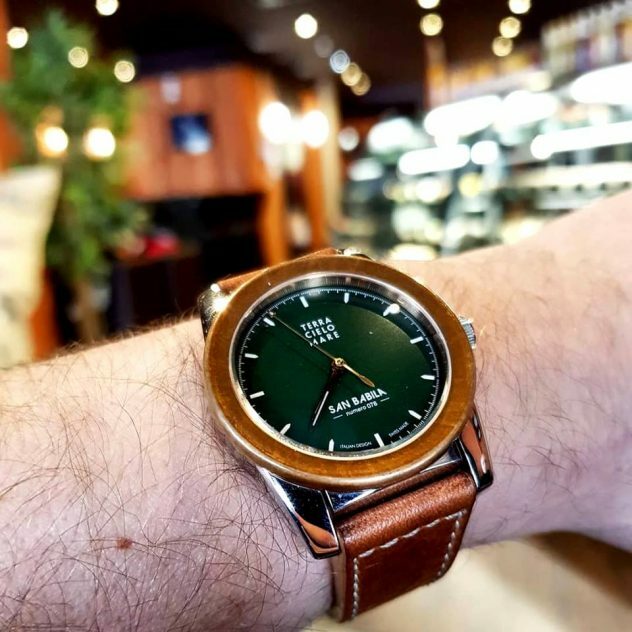 The price for this very stylish watch is 1980€ (around US 2250$) which is not bad when we think of all what’s into this piece.